Since its beginning in 2003, LifeLine has depended primarily on volunteers to meet the needs of the families that we serve. It is impossible to quantify all of the support that our volunteers provide. However, each year since 2008 we have tried to recognize the volunteer that has made the biggest difference during the calendar year. These volunteers have contributed hundreds of hours to childcare, administrative and organizational duties, mentoring, cooking for families, fundraising, or working on specific projects that support the mission and vision of LifeLine. We are grateful for the contribution of each one. Lisa Mattheiss met Susan and Leonard Williams as a college kid when they went to church together not too long after Lisa had moved to Chattanooga. Initially Susan and Lisa shared the handoff from nursery to Sunday and Wednesday night classes. They became part of Lisa’s life and have been now for over 20 years. Lisa has often called them “my Chattanooga parents”. When Jeff and Lisa got married, they couldn’t afford a wedding and a reception, so Susan got the ladies of the church together and made sure they had a reception. Through the early days of Emily’s diagnosis and birth and surgeries, Leonard and Susan were there. When Emily got her first wheelchair, Leonard asked Lisa “How is she going to get in your house by herself? Find the materials, and I’ll make her a ramp.” When the ramp grant provider attacked Lisa and her parenting because the provider was upset that Lisa wanted Leonard to build the ramp instead of some unknown person that he chose, (in the days before Lisa was the advocate that she has now become), it was Leonard who called him up and set him straight on whose job exactly it was to serve whom. 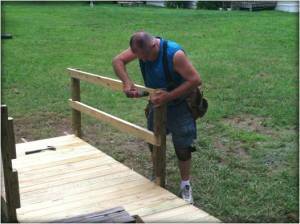 After an apology call, the supplies were delivered and Leonard built the ramp his way. More grants, more accessibility projects. Since the first ramp project, almost every two years, Leonard built or modified something else, from one end of the Mattheiss’ home to the other. The bathroom was gutted and rebuilt. The kitchen was gutted and rebuilt over two different grants. The ramp was extended to the yard. Plumbing, electrical, flooring, cabinetry, tile, sheetrock, you name it, Mr. Leonard could do it, or knew someone who could come and help him do it. Emily can still ride her hand-pedaled tricycle that she got when she was about 3 or 4 because Mr. Leonard welded additions and built new tricycle seats to make it last a few years longer. Not long after his own health crisis about four or five years ago, Leonard showed up on work day at LifeLine to lead a team of volunteers in installing a floor. He couldn’t physically do all the work, but he could lead the team. He built other ramps and used his truck to haul things to support LifeLine through the years. But Leonard Williams passed away on March 20, 2014. His building stopped, but not his legacy of generosity and service. So the Mattheiss come home every day to a monument to Leonard’s life and ministry. He would surely laugh and shake his head, but to them it is. It is a daily reminder of the difference one man and his wife has made in their lives. But the physical structure is only a part of his legacy. The Mattheisses learned about marriage from watching his relationship with Mrs. Susan. They learned about parenting. They learned about ministry. They learned about trusting God when they didn’t see answers. They learned about following God when it didn’t make sense. They earned about giving beyond what they thought they had. They learned about quiet leadership…at home, at work, and at church. They learned about following their calling, one person or one family at a time, most of the time behind the scenes. They learned the priorities from Mr. Leonard…God, family, then church and ministry. Advocacy. Time and resource investment. For now and for eternity. When Lisa told her youngest daughter Caroline that Mr. Leonard went to live in heaven, Caroline said “He was a good bridge builder, huh, mama?” Yes, Caroline. He was. He built bridges all over the state of Tennessee. ..the kind you drive over in a car. He built bridges all over the Mattheisses house…the kind that led to Emily’s independence. Mr. Leonard also built bridges all over lives with his hands, his words, and his life…the kind that lead to Christ. Susan once told Lisa that “If it needs one nail, screw, or bolt, Leonard will put two or three, just to make sure. It won’t fall apart.” He built his life the same way. If something was needed, he went above and beyond “to make sure”. We love you, Mr. Leonard, and will be forever grateful for all of the bridges that you built in our lives. Our lives will never be the same for having you in it. We honor you by naming this Volunteer of the Year Award for you in gratitude for all of the hours you invested in the Mattheiss family, in LifeLine, and in LifeLine’s families.